Get your toughest gardening questions answered by the real experts. Visit the Master Gardeners from the Ohio State University extension office in booth 202. Attend Oktoberfest for FREE after you visit the Home and Garden Show. Ride our free shuttle just for fun! First 500 visitors receive a FREE 5-pack of spring-flowering bulbs, courtesy of The Columbus Dispatch. Join Pilot Dogs for a hands-on demonstration of guide dogs, and how they provide independence and mobility to the visually impaired in a sighted world. Participants will be able to watch a trained guide dog work in real life situations, while getting a better understanding of how people live with vision loss. Football Season is finally here and we have a gift for you...FREE tickets! Come to the show and receive your Instant Win Playcard upon entry. Then stop by the kiosk in aisle 100 and spin to win. One lucky winner will walk away with OSU vs Rutgers football tickets. Good luck! "House Hunters" takes viewers behind the scenes as individuals, couples and families learn what to look for and decide whether or not a home is meant for them. A number of local couples and agents have been featured on the show, come hear their behind-the-scenes stories let by Cameron Fontana and Alissa Henry, who you know from ABC 6/FOX 28 television. Fall in love with the autumn garden! Join us for an entertaining and educational discussion on the gems that shine in our breathtaking Ohio gardens in the autumn. Learn from a 43 year gardening vet the most stunning shrubs, perennials, annuals, grasses, and bulbs that provide beauty through foliage, floral, or fruiting interest late season. Close out your garden in style with unexpected fall color! Download this pamphlet if you'd like to follow along with her presentation. Does your bathroom feel cramped and cluttered? Do you wish it could be different? There is good news…IT CAN! Join us as we share 10 simple things you can do to make your space look and feel bigger. Presented by Simple Bath / Simple Kitchen. A few months ago, The Columbus Dispatch and the Home and Garden Show invited people in central Ohio to share pictures of their beautiful gardens, and enter the first annual Dispatch Backyard Garden Awards-- now it's time to announce the winners. From home landscaping to vegetable garden, we will announce the winners in each of six categories. We will also announce the People's Choice Award, which is determined by the community voting on their favorite single Garden from all of those submitted. Come join in the fun! Join Leo Berbee Bulb Co. experts Henk and Marjolein Berbee to learn how to have lasting color in your Spring garden. You will learn the benefits of “Lasagna Layering” your bulbs for blooms all season. Each person will receive a 6 inch pot, soil, and 5 bulbs -- a mix of tulips, hyacinths, daffodils and crocus. You will follow the step by step instructions to layer these bulbs, then take them home and enjoy next Spring. Whether you follow this technique in your garden or in a container you will not be disappointed with the lasting color. Attend Oktoberfest for free after you visit the Home and Garden Show. Ride our shuttle just for fun! Learning about the animals that travel with Jack Hanna. Discover where they are from, what they eat, and possibly touch the birds, reptiles and a variety of mammals. He was the guy in college who turned off sports and changed the channel to "This Old House"--now he's living it. 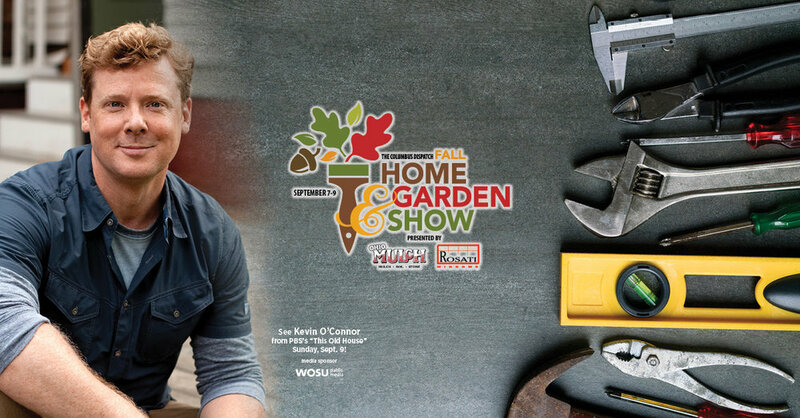 Kevin O'Connor, 50, is the host of the longest-running home-improvement show on TV. Come hear him answer your questions about renovating old-homes. Then stick around for a meet-and-greet following his first stage appearance. Check out his story in the Columbus Dispatch here and be sure to listen to his podcast with "Life in the 614". Meet Maxx, LEGOLAND Discovery Center Columbus’ Master Model Builder, near the stage. Families are invited to play, learn and build during a special workshop with Maxx Davidson. Builders of all ages are encouraged to participate! 2:30PM - 3:15 PM | The Incredible Unforgettable Bug Lab Experience, with Dr. Insecta. Experience real entomology magic as Dr. Insecta introduces you to some of the largest live insects on the planet. Bug Lab is an interactive enrichment program that entertains, educates and desensitizes fears we have about these incredible creatures that let us share in their world. He was the guy in college who turned off sports and changed the channel to "This Old House"--now he's living it. Kevin O'Connor, 50, is the host of the longest-running home-improvement show on TV. Come hear him answer your questions about renovating old-homes. Check out his story in the Columbus Dispatch here and be sure to listen to his podcast with "Life in the 614".